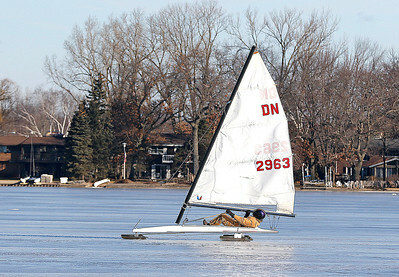 H. Rick Bamman - hbamman@shawmedia.com Paul Myers is greeted by his son's Goldendoodle, Simba, as he guides his one-person wooden DN Ice Boat back to shore after running over Crystal Lake on Thursday, Feb 3. "During the depresion the Detroit News paper sponsored an iceboat design contest to help perk up people's spirits," he said while describing the history of the boat model. 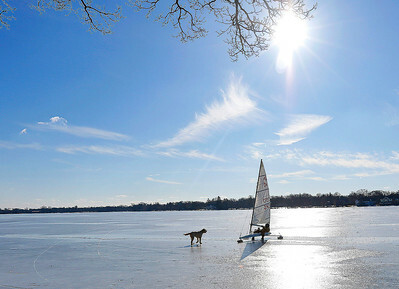 H. Rick Bamman - hbamman@shawmedia.com Paul Myers moves his one-person wooden DN Ice Boat away from shore for another run across Crystal Lake as his son's Goldendoodle, Simba, watches on Thursday, Feb 3. "Ideal conditions are thick and smooth ice, no snow and a breeze." Myers said. 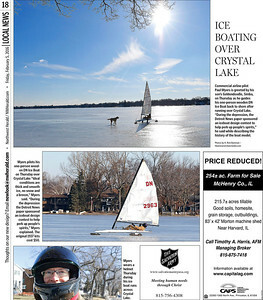 H. Rick Bamman - hbamman@shawmedia.com Commercial airline pilot Paul Myers of Crystal Lake wears a helmut during his ice boat runs across the lake on Thursday, Feb 3, 2016. 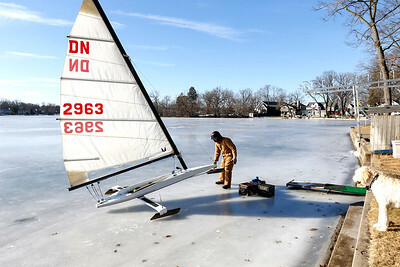 H. Rick Bamman - hbamman@shawmedia.com Commercial airline pilot Paul Myers pilots his one-person wooden DN Ice Boat over Crystal Lake on Thursday, Feb 3. 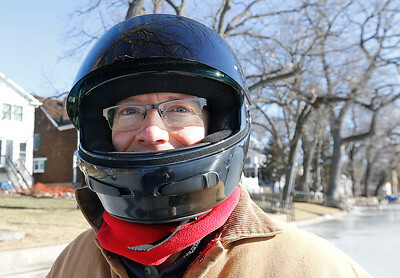 "Ideal conditions are thick and smooth ice, no snow and a breeze," Myers said. "During the depresion the Detroit News paper sponsored an iceboat design contest to help perk up people's spirits," Myers explained. The original 1937 kits cost $50. 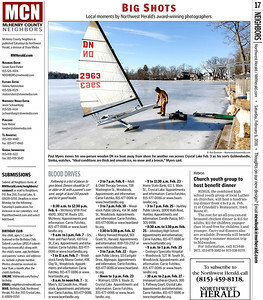 Commercial airline pilot Paul Myers of Crystal Lake wears a helmut during his ice boat runs across the lake on Thursday, Feb 3, 2016.